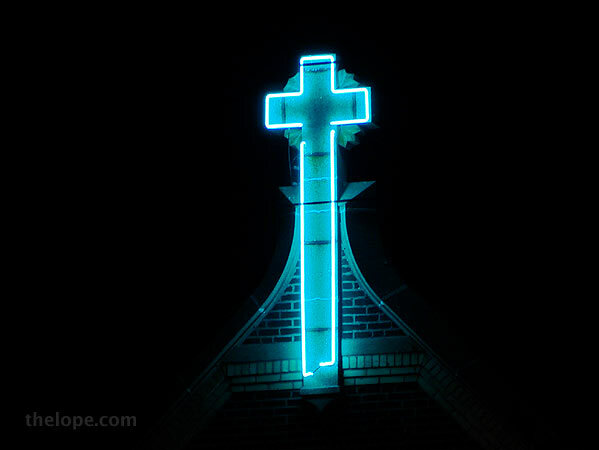 I was quite delighted when I saw the blue neon cross above nocturnal Route 66 near Hamel, Illinois. Having just left the St Louis area bound for the 2008 Route 66 Festival in Litchfield, Illinois, I had hoped for something of interest in the dead of night. The mother road did not disappoint. 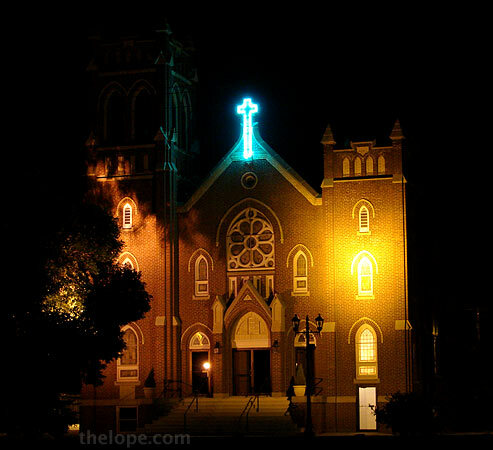 It's not really called the "church of the neon cross", of course. This is St. Paul Lutheran Church, a 77-year-old church building that serves a congregation begun 153 years ago. I emailed Rev. William Weedon of the church and he told me the cross was given in about 1946 in memory of Oscar Brunnworth who died in action in World War II. He believes Mr. Brunnworth died in Italy. I'm seeing more and more neon crosses these last couple years. They are usually confined to signage and their consistent appearance - tall, thin, white - suggests they are mass-produced add-ons. What impresses me most about the St. Paul cross is that it looks like it belongs there - like the original architect would have approved. Kudos to the church powers-that-be who decided over 60 years ago to allow something different, and what an enduring way to remember the sacrifice of Oscar Brunnworth. Awesome and amazing, finding a treasure tucked away like that. The artwork is fascinating. Thank you for sharing this.